Topps has tried many crazy products, often called "test issues". Test issues were usually only distributed in limited areas and were difficult to find. 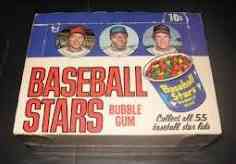 Candy Lids were one of Topps most unusual; little tubs of candy with player's photos on bottom of the 1 7/8" lids. The 10 cent candy's came 24 to a box. Sealed tubs can still be found in the $150 to $200 range. Called "Baseball Stars Bubble Gum", the 1970 Topps Candy Lids set had 24 different players, while 1973 Topps Candy Lids had 55. Topps released their first Candy Lids in 1970. The 1970 Topps Candy Lids are very, very hard to find and had small photos of Tom Seaver, Carl Yastrzemski and Frank Howard. In 1973 the candy was replaced by gum, the mini photo of Frank Howard was gone from the top of the lid and team logos were airburshed off the player's caps. Even the tiny Yaz and Seaver photos logos removed. 1973 Topps Candy Lids are hard to find, but not nearly as scarce as the 1970's. In 1972 a Topps Candy Lids issue was planned but never released although a few proofs do exist. Topps released two other test issue sets in 1973 (1973 Topps Pinups and 1973 Topps Comics). The 1973 Topps Comics and 1973 Topps Candy Lids shared many photos and again had no team logos. If thinking "licensing dispute", you are likely right. Topps received player's union's permission for these test issues, but not Major League Baseball's. Issues over rights & fees with MLBPA and the player's union resulted in Topps started shutting down future production of test issues putting an end to some of their most fun collectibles. Interesting & very tough to find 1970's Topps Test Issue !